When I think about so many of my favorite things to eat I think refreshing, light, and savory. I will never end my romance with butter and cream based sauces, crusty loaves of bread with olive oil, or large portions of pasta mounded high with salty parmigiano reggiano. I will never stop craving these masterpieces but there is much to be said about a light, refreshing meal eaten on a mid-summer evening. The minute someone mentions the word “refreshing” my minds immediately turns to the obvious; lemon. Citrus has power, a deep mysterious power, to transform nearly anything into something special. Sometimes the obvious is perfect, why fight it? These shrimp are packed with flavor, so let us begin! 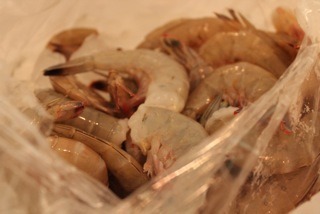 Begin with one pound of fresh shrimp, you can buy them already peeled but I like to peel and clean them myself. Place the shrimp on skewers and heat up your grill to about 400 degrees. Next, zest and juice two lemons. Combine the zest and juice with one stick of butter and two smoked and dried chipotle peppers (broken in half, please) in a small saucepan. Place the saucepan over medium heat until butter is melted and begins to boil. Remove from heat and leave out for at least a half an hour. This will allow all the flavors to enrich the butter. (This butter is also fabulous spread on grilled ears of corn, just thought I would throw that out there.) 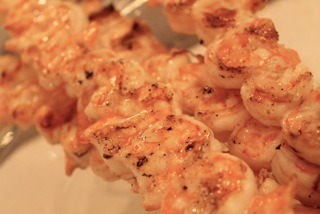 Strain to remove chipotles and brush over shrimp skewers before grilling. During the grilling I like to give the shrimp 1-2 more coats of the butter so the flavors really stand out. Do not leave the shrimp on the grill too long or else you will have a dinner full of shriveled up pink things, yuck. Grill the shrimp until there color has completely turned into a light salmon and no longer. These shrimp are fabulous by themselves or tossed into a bowl of linguine, enjoy! Combine all ingredients in a small saucepan and place over medium heat until butter is melted and begins to boil. Remove from heat and leave out for at least a half an hour. (This will allow all the flavors to enrich the butter). 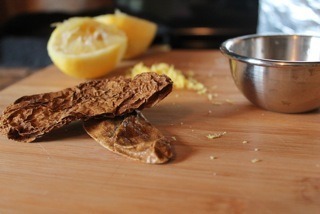 Strain to remove chipotles and brush over chicken, shrimp, corn or just about anything else. Enjoy!